Traditional roles of access points, such as association or authentication of wireless clients, are done by the WLC. Access points, called Lightweight Access Points (LAPs) in the unified environment, register themselves with a WLC and tunnel all the management and data packets to the WLCs, which then switch the packets between wireless clients and the wired portion of the network. All the configurations are done on the WLC. 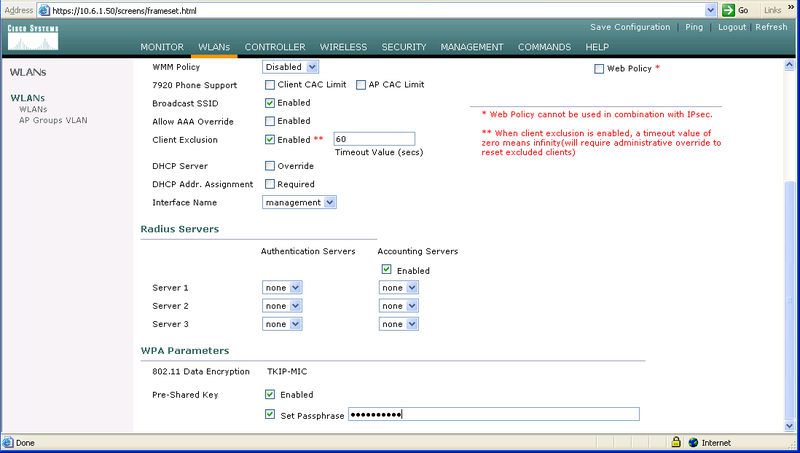 LAPs download the entire configuration from WLCs and act as a wireless interface to the clients. 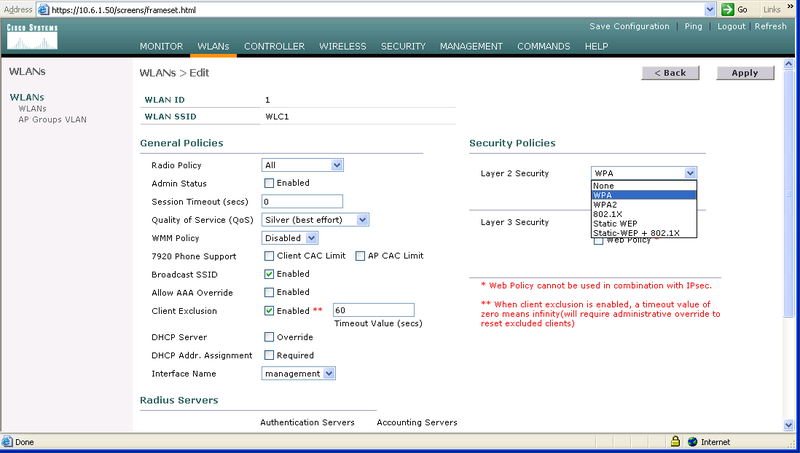 The WLC, can be set up using the web browser GUI, or the CLI, the CLI is commonly used to initialize a wireless LAN Controller to allow for routing monitoring and configuration from the GUI. The GUI allows up to five users to brose simultaneously to configure parameters and monitor operational status for the controller and it’s associated LAPs (lightweight AP). Warning! The default WLAN security policy requires a RADIUS server. Please see documentation for more details. Must match among mobility groups. Controller group to allow dynamic RF adjustments and roaming for wireless clients. there is no server defined, this is to prevent open authentication security vulnerabilities. 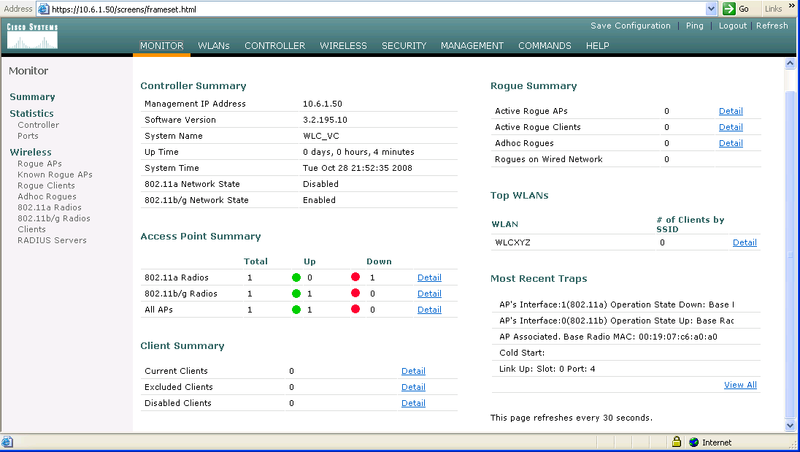 After you login in the monitor summary screen appears including information about connected AP. You may notice at first that you do not have an AP. the AP requires an IP Address via DHCP. the AP will need an Later 3 LWAPP communication to the controller and for any wireless clients. 1. Generally, WLAN is tied to an interface which is configured with a DHCP server. 2. When the WLC receives a DHCP request from the client on a WLAN, it relays the request to the DHCP server with its management IP address. 3. 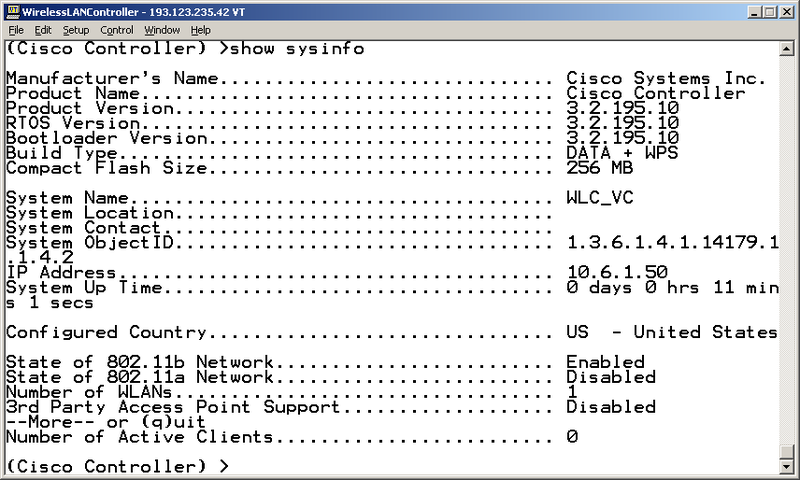 The WLC shows its Virtual IP address, which must be a non-routable address, usually configured as 1.1.1.1, as the DHCP server to the client. 4. 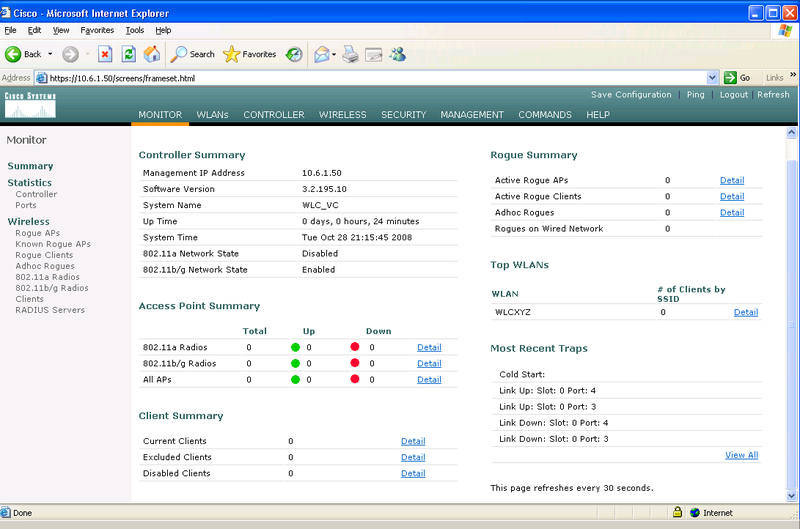 The WLC forwards the DHCP reply from the DHCP server to the wireless client with its Virtual IP address. The DHCP server of the wireless controller can service only directly attached layer 3 LWAPP AP and their associated wireless clients. We return to the monitor summary screen, still no AP in there, the LAPs will take a few minutes to load its ip address, operating system, and configuration from the WLC (hence the term “lightweight AP”, the screen automatically refresh every 30 seconds. Wait until the AP Appears before proceeding, you will also notice that the 802.11a radio will appear but remain down since you did not initially enable the radio in CLI configuration. In the past, security on WLANs was not a major concern. This lack of concern was, in large part, because WLANs were restrictive, we all know the WEP Key encryption is not secure, therefore, the majority of new clients are supporting WPA-PSK, let see how to configure these on the on the AP to operate with WPA-PSK enabled clients, using the WLC GUI web Browser. 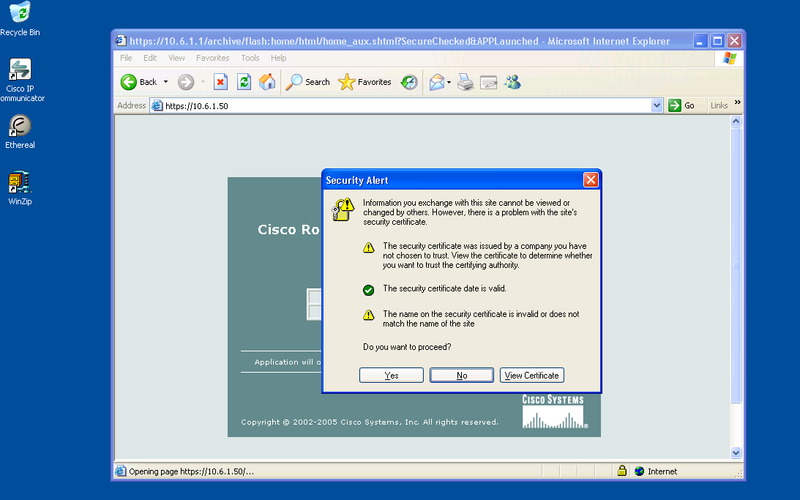 This entry was posted in Cisco, Technologies, Wireless. Bookmark the permalink. ← Matching on ^ASPath_ASPath$ Prepending information. Make sure to disable or change the default WLC SNMPv2c communities and SNMPv3 user (default/default). 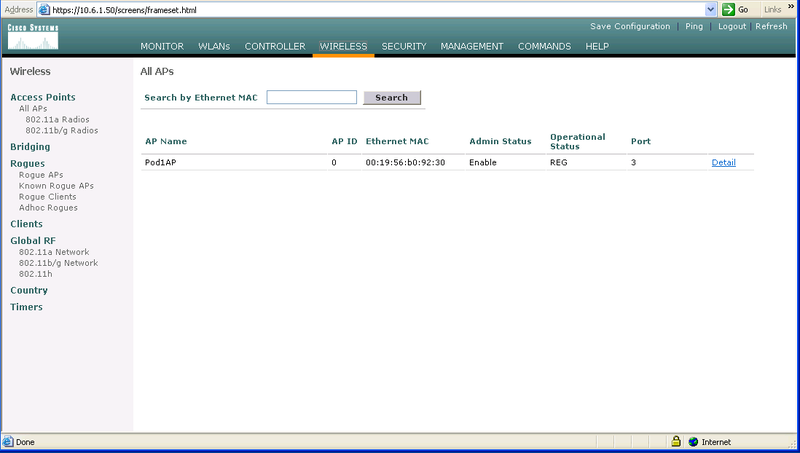 I have configured a WLC with one LAP directly connected to POE port-8 of controller.The LAP can be seen in GUI of WLC but operational status shows DOWN. Although the radios are enabled. Any suggestion? Very good read, some valid points were made. (This isn’t some stupid spam reply either, I’m a real follower. The DHCP server of the wireless controller can service only directly attached layer 3 LWAPP AP and their associated wireless clients. 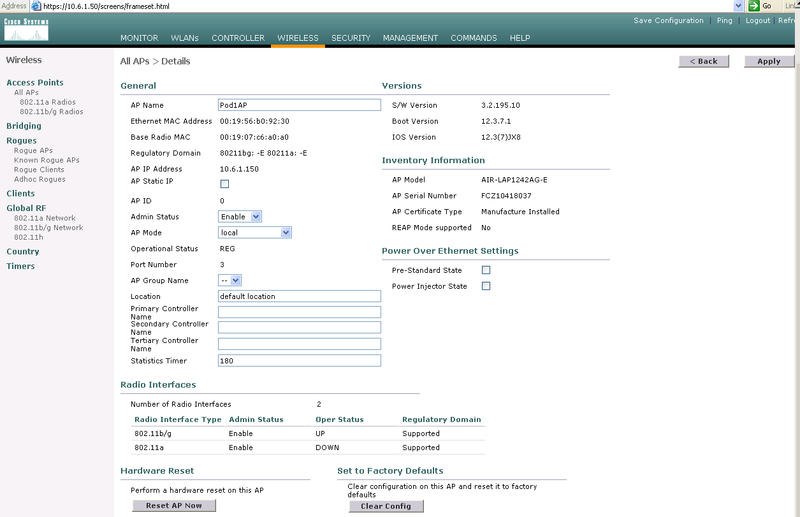 Example: My WLC that serves as a Mobility Anchor is configured as a DHCP Server – no clients are at the central site – a data center. However, all the clients on my Guest Network statewide use this DHCP Scope and this Anchor as a DHCP Server. Thanks Darby, for the Feedback!